A boat trip down the Kok River from Tha Thon to Chiang Rai could well count as one of your most enjoyable experiences in Thailand. If you elect to take this enchanting river trip, you will pass through some of Northern Thailand's most magical scenery, with a fascinating variety of diverse landscapes to take in along the way. 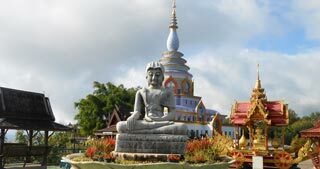 As you leave the environs of Tha Ton, you will initially pass through an area of flat rice fields and orchards, but the terrain soon becomes hillier, and you will spot the Wat Phra That Sop Fang hilltop chedi, with its twisting naga (serpent) staircase rising up from the riverbank. Continuing on, the banks become ever higher, with steep wooded slopes and a dense jungle backdrop. Then the village of Mae Salak comes into view where you may catch sight of villagers playing and bathing in the river with their water buffaloes. About two hours into your trip, the scenery becomes more rocky and stark as you approach the small rapids, where you may well get a refreshing soak as the boatman navigates your boat safely through. On the other side of the rapids, you will find the river filling up with boats from Chiang Rai that are taking tourists to the Karen village of Ruammid, some 20km upstream from Chiang Rai. 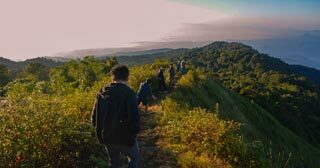 The landscape on the final leg of the journey opens up into a bare valley as you approach Chiang Rai. During the high season, you will find women from the Lahu Hill Tribe villages selling the wares on the riverbank. In deciding to make this trip, there are several options open to you, and each one has its distinct advantages. Your cheapest option is to take the public canopied longboat from Tha Thon Boat pier which departs daily at 12:30 pm, costs around 350B and takes about 4 hours to make the 100km trip. The boat makes several stops where you can disembark and visit places such Ruammid, which is well worth a visit. However, there is only one boat a day, and you should plan ahead for overnight stays. If you are in a group or you can gather a group together, you can hire your own boat. Which means you are more flexible on your departure time, and you can make as many stops as you like along the way. The boat will take six foreign passengers (more in the rainy season when the water is deeper) and costs 2,200-3,000B (round trip 2,500 -3,500B). Speak to your guesthouse in Tha Ton or go directly to the pier to organise. 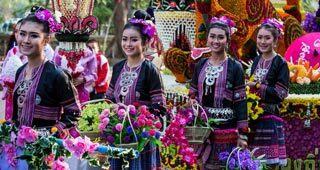 A third option is to book your boat trip as part of a tour, which will typically include overnight stopovers in a hill-tribe village. Your final, and for many, the most adventurous option, is to make the trip by bamboo raft, which can take two-three days, depending on the tour. The rafts will accommodate 2-6 passengers and will cost between 8,000 - 12,000B per raft. 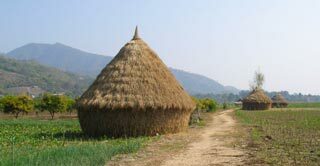 They will overnight at Lahu Hill Tribe village, and for the 3-day trip, also at the Hot Springs. Food and soft drinks are provided. There are also half and full day raft trips down the river, returning by road. 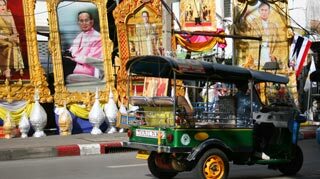 The last two options can be organised with tour agents based in Chiang Mai, Chang Rai or at guesthouses in Tha Ton. 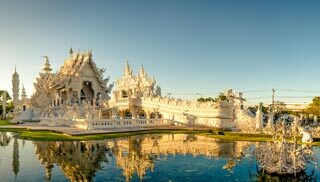 If you like, you can also make the trip in the reverse direction from Chiang Rai to Tha Ton, but it will take much longer as you are going upstream. The best time to make these trips is between November - February, when the landscape is at its greenest and the rapids are at their most exciting. Boats trips may be suspended in the extreme dry and rainy seasons if it is considered unsafe. You can overnight at a quiet guesthouse located between Mae Salak and Ruammid. 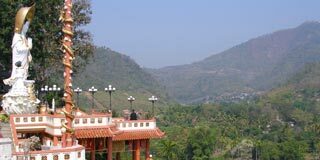 The village at Ruammid is a major setting-off point for treks to hill tribes villages that have overnight facilities, as well being home to an elephant camp. It has overnight facilities as well as a market, food and coffee shops. Been here? Share your experience with the world!